Preheat broiler. Arrange apricot halves cut-side up on a baking sheet and spoon ½ tablespoon honey into each one. Sprinkle sugar over apricots. Broil for 3 to 4 minutes, rotating the sheet once, until apricots are bubbling and caramelized. Remove from oven and allow to cool. Dice each half into small pieces. Place a crêpe cooked side up on a clean surface. Place 3 to 4 slices of brie towards the bottom of the crêpe. Layer with a small amount of apricots and pistachios. Fold the lower edge of the crêpe up over the filling, fold the sides inwards, and roll up over the filling, tucking the edges in as you roll. Repeat with the remaining crêpes and filling. 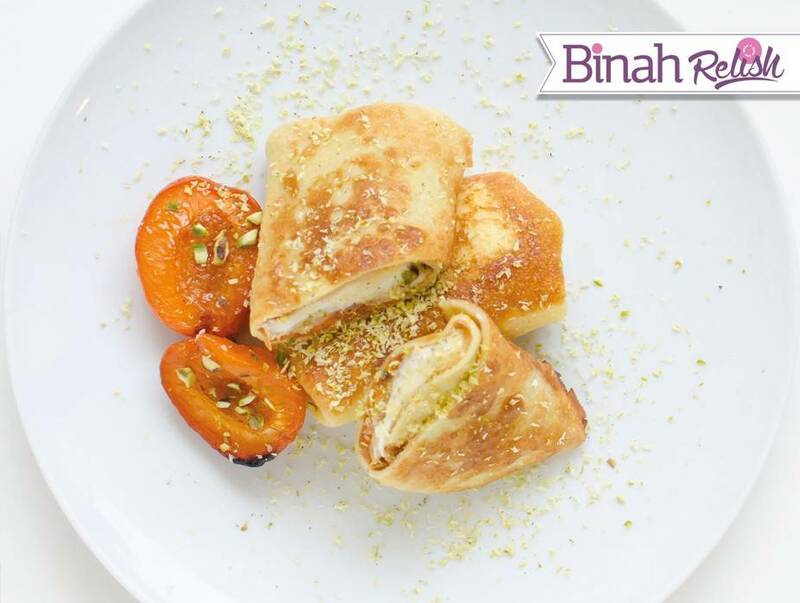 Serve blintzes warm, with a drizzle of honey and chopped pistachios.